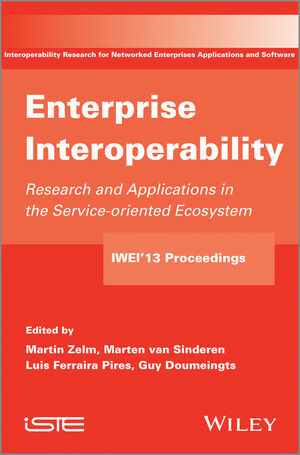 The book constitutes the proceedings of five workshops co- located with the Fifth IFIP Working Conference IWEI 2013. It contains the presented peer reviewed papers and summaries of the workshop discussions. Complementing the IWEI Conference program, the workshops aimed at exploiting new issues, challenges and solutions for Enterprise Interoperability and Manufacturing Eco Systems. The scope of the workshops spanned over a range of interoperability issues in Service Science and innovation, Model Driven Service Engineering Architectures, Service Modelling Languages, reference ontology for manufacturing , Case studies and tools particularly for SMEs, Business – IT alignment and related Standardization. An Architecture for Service Modelling in Servitization Context: MDSEA, Y. Ducq. A Set of Templates for MDSEA, D. Chen. Report Workshop 2, I.-S. Fan, V. Taratoukhine, M. Matzner. Interoperability as a Catalyst for Business Innovation, J.H.P. Eloff, M.M. Eloff, M.T. Dlamini, E. Ngassam, D. Ras. Process-Oriented Business Modeling – An Application in the Printing Industry, A. Malsbender, K. Ortbach, R. Plattfaut, M. Voigt, B. Niehaves. A Comparative Study of Modelling Methodologies Using a Concept of Process Consistency, E. Babkin, E. Potapova, Y. Zelenova. A. Fedotova, V. Taratoukhine, Y. Kupriyanov. Using Enterprise Architecture to Align Business Intelligence Initiatives, I.-S. Fan, S. Warner. Towards Enterprise Architecture Using Solution Architecture Models, V. Agievich, R. Gimranov, V. Taratoukhine, J. Becker. Report Workshop 3, M. Zelm, D. Chen. Standardisation in Manufacturing Service Engineering, M. Zelm, G. Doumeingts. Service Modelling Language and Potentials for a New Standard, D. Chen. An Approach to Standardise a Service Life Cycle Management, M. Freitag, D. Kremer, M. Hirsch, M. Zelm. Open Business Model, Process and Service Innovation with VDML and ServiceML, A. J. Berre, H. De Man, Y. Lew, B. Elvesæter, B.M. Ursin-Holm. R. Young, N. Hastilow, M. Imran, N. Chungoora, Z. Usman, A.-F. Cutting-Decelle. Standardisation Tools for Negotiating Interoperability Solutions, T. Santos, C. Coutinho, A. Cretan, M. Beca, R. Jardim-Goncalves. Report Workshop 4, S. Kassel. Experiences of Transferring Approaches of Interoperability into SMEs, F. Gruner, S. Kassel. Report Workshop 5, L. Ferreira Pires, P. Johnson. Service-Oriented Enterprise Interoperability in Logistics, W. Hofman. An Ontological Approach to Logistics, L. Daniele, L. Ferreira Pires. Social Vision of Collaboration of Organizations on a Cloud Platform, A. Montarnal, W. Mu, F. Bénaben, A.-M. Barthe-Delanoë, J. Lamothe. Semantic Standards Quality Measured for Achieving Enterprise Interoperability: The Case of the SETU Standard for Flexible Staffing, E. Folmer, H. Wu. Requirements Formalization for Systems Engineering: An Approach for Interoperability Analysis in Collaborative Process Model, S. Mallek, N. Daclin, V. Chapurlat, B. Vallespir. Marten van Sinderen, University of Twente, The Netherlands.